The last month has been a month of amazing donations to Room to Grow Foundation. 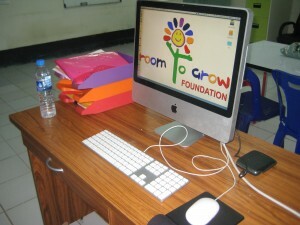 In addition to throwing another killer fundraiser, the folks at ELC Bangkok were able to help set up our new child protection office with a fantastic computer which will help manage files and finances, communicate with donors and directors. With time ticking down until the start of the school year, we put out a call for help getting 29 children registered for another year at Thai school, especially to get their school fees and uniforms paid for in time. Today, we’ll be completing their registration and sending them off to school thanks to our incredible private donors. True superstars! During the month of May, Director Sandra Jones ran around Saskatoon picking up donations of used clothing and household items which Value Village transformed into cash donations. Thanks to everyone in Saskatoon who gave us your used clothes and goods. This year’s underwear campaign will be funded by your old clothes (and just to be clear, the underwear provided will NOT be used!). Meanwhile Down Under, we had a donation of an excellent digital camera, which will help us bring you more beautiful pictures of our work in the future. Its been a really amazing couple of months and its amazing what so many people can accomplish by giving what they can. Many of our donations now will be funding our emergency assistance fund for children. We provide help finding shelter and safety to children in emergency situations, help connect kids with medical and legal assistance and help families start to re-build their lives after experiencing trauma and distress. Although its often difficult seeing people experiencing such difficult situations, it is an incredible experience to be able to provide them with material assistance during such a critical time. Our average family needs between $25 and $75 to help with food, clothing, shelter and transportation for medical care, which means that small donations have a huge impact. With an office located at the old Mae Tao Clinic space in Mae Sot, we’ll also be able to accept donations of used clothing (children and adults), toys, learning material, art material, hygiene supplies, etc. So if you plan on traveling to Thailand and want to fill up an extra suitcase, our goal is to provide families with small dignity kits with basic necessities to help them during their crisis. Please get in touch if you are headed our way for suggestions on what you could bring along. Thanks again to all our donors for your incredible help. Its been a wonderful month for us here at R2G. No Replies to "Amazing Contributions"